Classical Syriac is the language of the Syriac speaking churches and was used over a wide area of the Middle East so that a large amount of documents have come down to us. 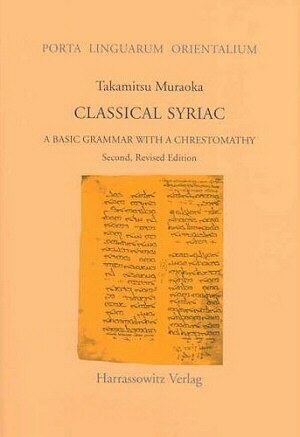 This grammar, designed to replace Brockelmann's "Syrische Grammatik", consists of a descriptive, namely not historical or comparative, grammar of the language with a fairly extensive morphosyntax and syntax, some practical language exercises with key, verb paradigms, a subject index, a bibliography of 25 pages on Syriac studies, an anthology of extensively annotated texts representing various genres of the Syriac literature from various periods in the three Syriac scripts, an accompanying glossary and a list of proper nouns occurring in the anthology. Although the grammar is intended primarily for beginning students of Syriac, it also contains (especially in the morphosyntax and syntax section) results of the author's independent research. In this second edition, obvious errors in the first edition have been corrected, the bibliography has been expanded by six pages, and the presentation has been improved upon. Classical Syriac - Amazon's online bookstore.